With $19 million in funding but the Timeline redesign cratering its traffic, BandPage needed to diversify beyond Facebook. So today it launches BandPage Everywhere to let musicians build websites and embeddable widgets as well as Facebook Page apps. Rather than inefficiently trying to sync content, the half million artists hosted by BandPage can now upload streaming music, photos, videos, or tour dates just once and have them pushed to all their online presences. Since 2009, BandPage has focused 100% on building Facebook apps for musicians in need of a home after the fall of Myspace, including Rihanna, Green Day, and Selena Gomez. http://www.facebook.com/rihanna/app_178091127385?ref=ts. But that was just the opening act. When BandPage started, Facebook was emerging as a powerful way to connect with and retain fans, but there were no native music features like on Myspace. ReverbNation was dabbling in Facebook apps, but BandPage (then known as RootMusic) turned up the volume. It raised some seed funding followed by $2.3 million Series A in January 2011 and a massive $16 million Series B in August that year to build out the team and tech behind what would become a 500,000 client base and 32 million monthly visitors to the musician apps it powered. BandPage was cheap, full-featured, and beautiful. 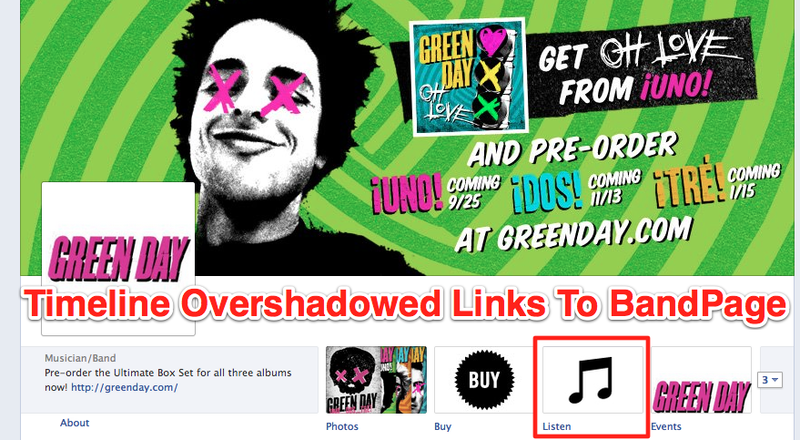 BandPage started planning to expand outside of Facebook, where ReverbNation and Bandcamp were hosting artist websites. But then in February 2012, Facebook moved Pages onto the Timeline design, and it hit BandPage like a tour bus crash. This removed the ability for musicians to set their BandPage app as their default landing page, and added the glossy cover image and other features that distracted visitors from the little box leading to an artist’s BandPage. 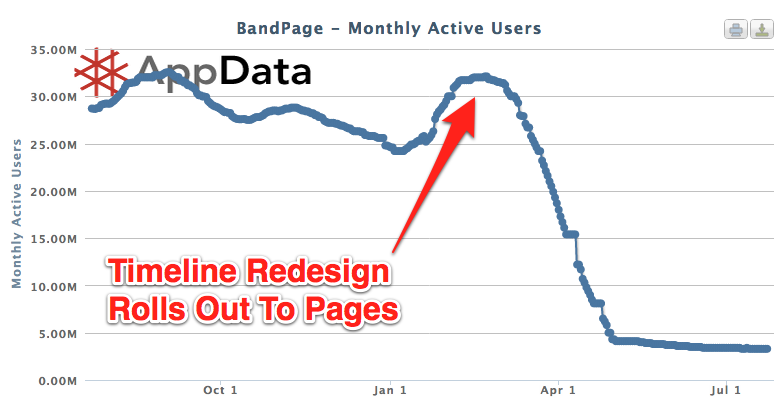 In two months, BandPage lost over 90% of its traffic, plummeting from 32.1 million monthly active users and 1.5 million daily active users to just 3.3 million MAU and 130,000 DAU according to app tracking service AppData. What BandPage is now is the central hub where musicians can update their content online. From a single admin interface, artists can upload their content, build out their Facebook apps, embeddable widgets for WordPress, Tumblr, and other sites, and create full-fledged standalone sites, then sync content across them. Creating a professional looking site takes just minutes, and is as simple as selecting a template and tabs wanted, deciding on a light or dark theme, and adding a background image. BandPage Extensions widgets for photos, videos, bio, tour dates, mailing list, and streaming music can be easily recolored and resized to fit any site’s space and style. 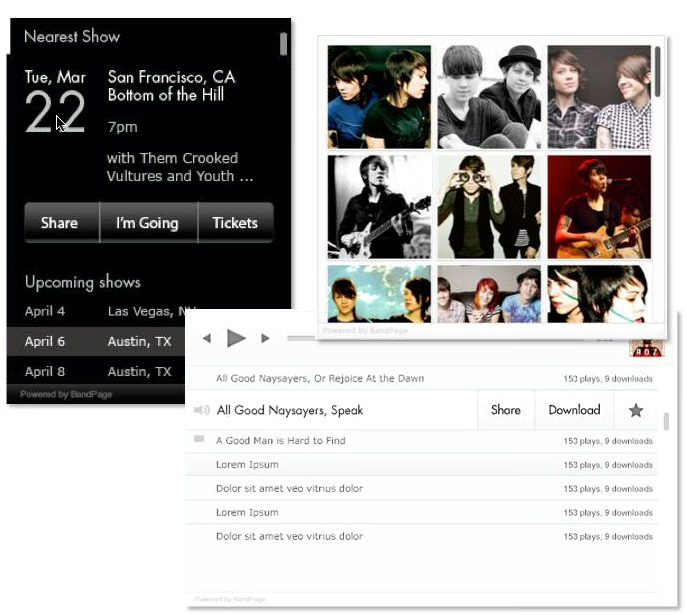 The tour dates widget now highlights the “nearest show” based on a viewer’s IP address, and BandPage Websites and Extensions can be instantly hooked into Facebook’s Open Graph for auto-sharing of favorite songs and event RSVPs. Interestingly, there’s no cross-web status update publishing tool. While deeper hooks into Twitter might come down the line, for now BandPage thinks musicians are best off posting feed updates one-at-a-time so they’re tailored to the formats of Facebook, Twitter, Google+, and other sites. The new BandPage Everywhere features will always be free, though users can still opt to pay $2 a month for advanced social features on their websites. BandPage doesn’t offer any ecommerce options right now beyond an integration with TopSpin. However, I suspect its plan to earn money includes tie-ins with ticketing companies like TicketFly and Ticketmaster and its own ecommerce platform for merchandise. This would help artists make more money from the BandPage while netting the startup a cut. Convincing bands to pay a monthly rate for extra features may be tough, taking a percentage of dollars it earns them could be easier on the ears and wallet. Today’s diversification is a wise move for BandPage that shows its maturity. Sider isn’t content to burn out or fade away. Instead, his company is going back to the studio to make the musician’s life even easier, so they spend less time fiddling on their computers and more time rocking out.